A complete 360º approach when you need BIG changes! WHO NEEDS THE STRAIGHT PACAKGE? Does it feel like everything is going wrong and nothing you’ve tried is working? Is your house in flames and the fire department’s nowhere to be seen? Are you ready to make some serious changes? We can help. Maybe your office is doing “fine”, but it’s been just “fine” for a decade now, and you’re not sure it’s going to last? You’re not ready to retire anytime soon, but maybe you’ve gotten a little complacent and you want to shake off some of the cobwebs? We can help. Or perhaps your ortho office is only a couple years old and now that you’ve got your feet under you, it’s time to really invest in your future and lay the ground work for the next phase of orthodontic practice growth? We can help. YOU NEED THE STRAIGHT PACKAGE. This is the big one. For those problems that are too big to get your arms around quickly, we offer a complete solution. The Straight Package, the flagship offering of Straight Consulting, has it all. This package is designed for any orthodontists who needs a holistic, deep-dive analysis of the inner workings of your ortho practice. If the Quick Fix is an oil change, this is rebuilding your engine. You get not one, but two on-site visits. We’ll begin the engagement with an initial office visit to identify the biggest issues and meet your team. Following that, we’ll complete a SWOT Analysis (that’s short for Strengths, Weakness, Opportunities, and Threats if you’re not familiar) so we’re all clear what’s on the agenda! 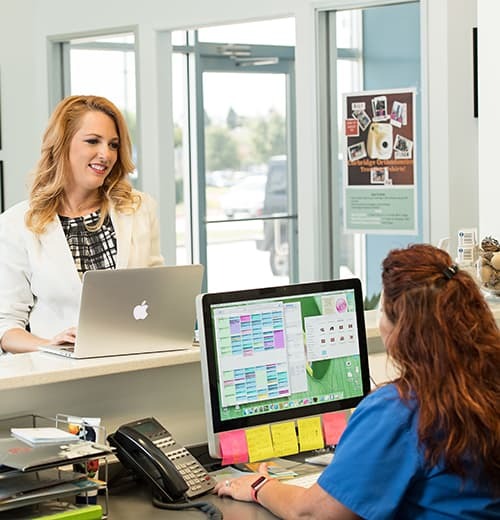 From there, we’ll host bimonthly team calls with every one of your stakeholders, from the Treatment Coordinator and Office Manager to the front desk and the clinic. We’ll even get on the phone with your husband or wife if they’re playing an active role in the business. After all, this isn’t just TC Coaching, or helping your OM with a few things. Our goal is to positively impact every single member of your team! Along the way, our ortho consultants will get hands-on with every facet of your business: TC Coaching and overall Team Development, we’ll refine your Marketing Strategy (both internal and external facing), elevate your New Patient Experience, make sure your Invisalign case are up, look at your Finances, develop a Schedule template that supports your goals, and anything else we come across as well. We’ll give you all our goodies! We’ll also break that up with a pair of quarterly doctor calls so you can stay abreast of our progress and weigh-in on next steps. Then, we’ll have a second on-site visit to check in and see how we’re doing and make any additional course corrections for the final part of the engagement. Then, once we’re done, we’ll wrap things up with you and submit a detailed report so you can review our findings any time you like! Think of the Straight Package like Extreme Makeover: Ortho Practice Edition. It can be a little painful at times, and it’s certainly not for the faint of heart. For it to be effective, we need total doctor buy-in. But if you commit to the process, the results can be staggering! Interested in the Straight Package?